Mike McCarron is the President of Left Lane Associations, M&A advisors specializing in the Canadian transportation sector. Mike is a 33-year industry veteran, entrepreneur and founder of MSM Transportation (est. 1990) which was sold to the Wheels Group in 2012. Under his leadership, MSM won numerous business awards including the Top Canadian Motor Carrier of the Year for 7 consecutive years. Over the past 25 years, Mike has served on the Board of Directors of the Toronto Transportation Club, Ontario Trucking Association, Canadian Trucking Alliance and the National Transportation Brokers Association. He is a regular industry speaker and monthly columnist for Today’s Trucking magazine (Open Mike) where, twice he was a finalist for the KRW Award for best regularly featured Canadian columnist. 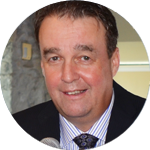 Mike McCarron is also the former owner of the storied St. Michaels Buzzers Junior “A” Hockey Club (winner of 3 OJHL Championships under his leadership).